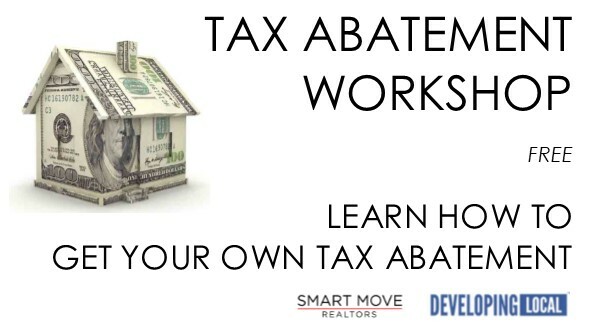 Learn the details + the process to get it tax abated! over 15 years of experience in residential and commercial real estate. over a decade of experience with renovations, new construction + tax abatements. Developing Local is a Residential and Commercial Development company specializing in Tax Abatement Programs, Historic Tax Credits and Multi-Family real estate. We help our clients make money! Homebuyers who purchase newly constructed housing will continue to pay taxes on the land and/or existing structures. However, taxes on the value of the newly built home structure will be abated for 15 years. Owner-occupants of single family homes making improvements of at least 20% of the current market value of the existing property will be exempt from paying property taxes for 10 years on any increased value of their property due to improvement. Owners of single or multi-family properties up to 4 units of rental property who make improvements of at least 50% of the current market value of their property will be exempt from paying property taxes for 12 years on any increased value of their property due to improvement. Property tax exemptions will be based on increased valuation of the property, due to significant improvements. AC HUMKO CRA, Brewer’s Yard, Easton Square Place CRA, Fifth By Northwest CRA, Franklinton CRA, Hilltop NID, Jeffery Residential CRA, Linden NID, Livingston and James CRA, Milo Grogran CRA, Near East CRA, North Central CRA, Short North CRA, Southside CRA and Weinland Park CRA. Buyers of condominiums (rental, converted or newly constructed).